I wrote about saving money and being healthier by not going to the store a little bit in 18 Necessities I Never Buy from the Stores Anymore (And What I Do Instead) last year about this time. Since then, I have expanded my list to include even more items! I thought I go ahead and share this brand new list with you and give you some more ideas on how to stay on your journey to self-reliance! Do you ever feel like the stores and big business are in charge of your life? Well, they aren’t. YOU are in charge. YOU can decide to refuse chemicals. YOU can decide to get rid of processed foods. YOU get to figure out how much and how badly you want to detoxify your body, home, and life. And guess what? If you’re into saving money, you’ll save a TON in the process too. I’ve broken this new and expanded list into several categories: Body, Household, Foods & Supplements, Pets, and my all time favorite: Remedies & First Aid. My suggestion for you is if you are just starting out, pick the easy things. And pick things you’ll enjoy creating. Then just expand from there! One way to start out is with my latest eBook: Herbal Salves, Oils, Butters, & Balms. You’ll get 22 plus recipes we use in our own home, and you’ll begin dabbling in using herbs and essential oils in a fun and easy way. Want more of a challenge? Try my other eBook: How to Make Your Own Hot Process Soap: Naturally. FTC Disclosure: There are affiliate links scattered throughout this article. If you click through and make any kind of purchase, I may earn a small commission at no extra cost to you. All opinions are my own. One of the most fun things to make for yourself are items pertaining to self-care. Body scrubs, butters, perfumes, and more can easily be made by you, for you, within just a few minutes. These kinds of items also make amazing gifts for friends and family too! I stopped using perfume years ago. Do you know what I use now? Essential oils. I create my own perfumes using a simple roller bottle, some almond oil, and my essential oils of choice. I get so many more compliments now, and I’m not driving people into allergic fits any more either. If you sign up for my newsletter, one of the gifts you’ll get is my short eBook on favorite essential oil blends and how to use them to make a spray, a roller bottle, or just diffuse them. There are lots of natural recipes for toothpaste out there, and I’m sure they are all pretty good. My favorite recipe includes myrrh gum powder because of how healing it is for the gums. You can find out how to make your own natural toothpaste (and it’s SO easy). I love my herbal mouthwash! It’s basically an herbal extract filled with herbs that clean, refresh, and heal your mouth and gums. It tastes pretty good, too! Here is where you can find my recipe for herbal mouthwash. Did you know you can make your own body butters and creamy lotions too? Why slather chemicals onto your body when you can make your own healthy version that smells like YOU want it it in just minutes? Here’s how to make an easy body butter. And in honor of it now being Fall, here is a link for my Pumpkin Spice Body Butter. You can find more in my eBook, Herbal Salves, Oils, Butters, & Balms. If you like lotion bars (and they are SO wonderful in the cold months of Winter), then check out my recipe for Cocoa-Tangerine Lotion Bars. These little gems are life savers! If I were a young mom these days, I would absolutely be making sure I knew what the ingredients are in baby products. So many of them are filled with toxins. Who wants to put toxic chemicals on their baby’s largest organ (the skin)? I love this Lavender Salve because of how soothing it is for the skin. If you want a more hard-core diaper rash cream, check out this one by Katie Wells. Keep in mind, her recipe calls for coconut oil, and some people are allergic to it (like me). You can substitute with shea butter. Natural hair care is my own personal biggest challenge. But once your hair gets used to different cleaning methods, it will shape right up! Just be patient, and give it a few weeks. Honestly, I like the No-Poo Method, and my friend, Dana explains it perfectly. But if you want to cleanse your hair, I like this shampoo bar soap recipe by Jan Berry. You can also sign up for her free soap making e-mail course if you like too! Homemade deodorant is one of the best things you can do for your pits. Trust me on this. I haven’t worn commercial anti-perspirant or deodorant in years! Now before you go grossing out, you can find out my reasons and how to make my basic deodorant recipe here. Then, if you want a fancy recipe, check out my Mango-Spearmint-Lime Deodorant. Once you try the natural stuff, you’ll never go back to chemicals again. There are SO many simple to make face mask recipes out there now, I honestly don’t know why anyone would actually buy a tub. Here’s a recipe for a firming face mask you might enjoy! And be sure to do some research on the webs, because there are lots of other really good ones. I love face masks made with honey. I really don’t like to use commercial sunscreen any more. There are plenty of oils that have a bit of sun protection factor that do a nice job as long as they are re-applied fairly often. However, if you feel you need to use commercial sunscreen, use non-nano formulas made with minerals instead of chemicals. You can find out more in this article about sunscreen, along with a homemade recipe. It is SO very empowering to make your own soaps. You get to choose how you want to make it, with what ingredients, and you can color and scent it naturally and inexpensively the way YOU want it. Here is a basic tutorial with pictures for how to make your own handmade soap. There are a TON of recipes on the blog, too. If you want an in-depth look at making hot process soap (my favorite) along with lists of herbs, clays, and other natural additives and over 22 soap recipe variations, then take a look at my eBook: Hot Process Soap Making. What about hand soap? And facial cleanser? Yep! I make those too. Here is how to make your own natural foaming hand soap. And if you want a great facial cleanser recipe that works great with all skin types, check through this article: 18 Necessities I Never Buy Anymore. It’s in that article. Did you know you can easily learn to make your own tea blends? No more stale tea bags from the store! Body scrubs are among the easiest things to make yourself, and you can get as creative as you want! You can make a basic sugar or salt scrub with a bit of almond oil for a nice exfoliating experience. OR you can step it up a notch! How about making a Juniper-Rosemary Herbal Body scrub? Or a romantic and sweet Rose Petal Body scrub? This seasonal Pumpkin Spice Sugar Scrub is just. AMAZING. And, if you are wondering which is better to use in a body scrub—-sugar or salt? You’ll have to take a look at this article for the differences. I make our own bug spray that naturally repels most insects, including wasps and mosquitoes. This year was especially bad for wasps of all kinds, and my bug spray was in high demand by the neighbors who knew about it! Basically, use equal parts lemongrass essential oil, peppermint essential oil, citronella essential oil, and lemon eucalyptus (optional). I don’t measure—-I just eyeball. Fill the bottom of a spray bottle about an eighth full of the essential oils. Yes, I know this is quite a bit of essential oil. Don’t worry—-it works! And it’s worth it! Then, fill with 1/2 white vinegar and 1/2 water. Shake well before spraying each time and keep it out of your eyes because it will burn. Those insects won’t come anywhere near you! NOTE: You can also spray this in outside areas where you want to repel wasps and mosquitoes too, including the eaves of your porch, doorways, etc. Since that bug spray I invented works so well, I decided to use that same similar formula in a push up repellent stick. You can find out how to make this convenient Go Away Bugs stick in this article. Add to a 2 ounce amber glass dropper bottle: 5 drops geranium essential oil, 10 drops frankincense essential oil, 5 drops rosemary essential oil, 10 drops cypress essential oil, 15 drops patchouli essential oil, 5 drops lemon essential oil. Then add around 60 drops of carrot seed oil, 80 drops rose hip seed oil. Then fill the bottle the rest of the way with calendula infused almond or olive oil. Shake, apply a few drops in the evening. NOTE: You don’t want to use this during the day because of the lemon essential oil being phototoxic. ***You can find out how to make calendula infused oil in this article. I’ve been making our own hand sanitizer for a long time now. All you do to make your own is get a 2 ounce spray bottle. Fill it halfway full of water. Add vodka, witch hazel, or rubbing alcohol (which is a lot more drying, keep in mind) to the water. Now add in about 20 drops of lavender essential oil. Not only is making your own soap fun, but you get to control the ingredients too! There’s a big trend these days for diy cleaning products. And I can sure see why. First of all, commercial products are expensive. And secondly, they are poisonous. Why not save some money and make your own in just minutes? This is my favorite spray. It has disinfectant properties because of the white vinegar and essential oils, but I can’t really say how much. All I know is I’ve been using this spray for years, and it works great. Just fill a glass spray bottle half full of water, half full of vinegar, and add about 60 drops of lemon, thyme, rosemary, oregano, or other germ-fighting essential oils. Shake, spray, and wipe. EASY, right? To clean our windows, I just use half water and half vinegar in a spray bottle. It works like a charm. I don’t put essential oils in this—-just vinegar and water. If you want some extra plant power, just infuse some lavender flowers into your white vinegar for about a week. Use this instead of the regular white vinegar if you like. Check this out! Want to use a softening, freshening dryer sheet that doesn’t have those noxious hormone-disrupting chemicals? Just cut up some 7x7 inch squares of cotton fabric. Place them into a glass jar, and pour in some white vinegar. Add some freshening essential oils if you want. Make sure the cloths are all moist and there are no dry parts. Toss one or two of these into your dryer. You’ll be amazed! When you take out your clothes, just put the cloths back into your vinegar solution! Want to make your own natural, handmade soaps? Check out my hot process soap making eBook. Your soap will be ready to use in hours, not weeks! I just get a small spray bottle and fill it 1/2 full of water. Then I add vodka or rubbing alcohol up to the neck. Drop in a few drops of antibacterial essential oils such as lavender, thyme, or rosemary. Shake and spray! 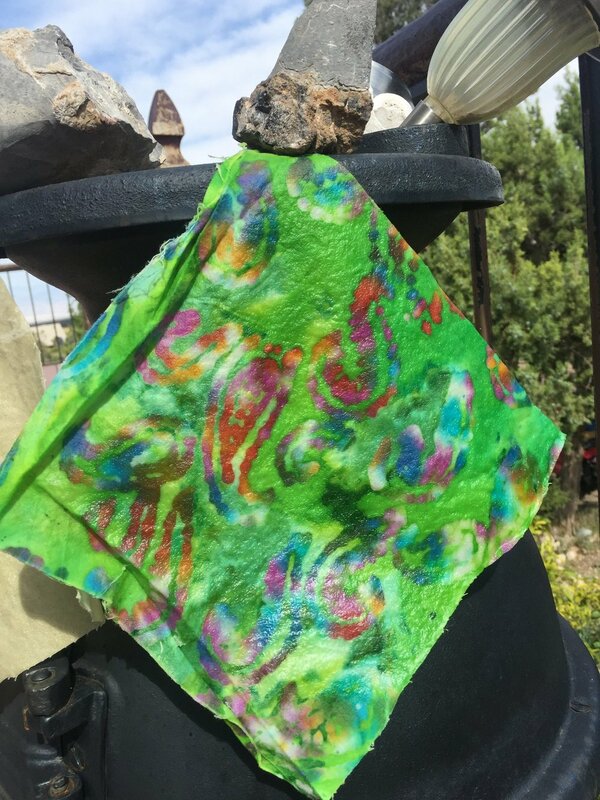 Did you know you can make reusable paper towels? Only, they’re not really paper. They are made of cloth. You can find out how I did this here. You’ll notice I don’t sew if you read through this article, but since I wrote it, I’ve learned basic things. Keep in mind that sewing up the edges will help, but is not necessary. Oh, how I hate plastic these days. Click here to find out why. One of the ways I have gotten rid of a bit of plastic in our home is by making our own plastic wrap. It works WAY better than the plastic wrap you buy, and these attractive beeswax cloth wraps are beautiful, too. You have to take a look at this! NOTE: I did an actual experiment with guacamole in the article so you can see how these work! Trying to help the environment and save some cash at the same time? Make your own cloth and beeswax cling wrap! This stuff works! There are so many easy dressing recipes out there these days. Please take a look by searching google for healthy salad dressings, etc. If you want to start with ketchup, check out my favorite recipe. You can ferment it if you want for extra nutritional power too. And, it’s SO easy and inexpensive. Here is my recipe for easy onion relish too. I’ll add it here because it’s pretty unusual and it tastes amazing! P.S. It’s also EASY. Do you know how expensive kombucha is? Oh, my goodness, it’s just ridiculous. Especially when you can make your own for just pennies and flavor it with whatever fruits and herbs spark your personal fancy! Here is how to make kombucha, and here is another article about how to make your kombucha fizzy. Well, here I am again, and I will try not to rant about the chemical concoctions sold in the stores these days: sodas. Why would you give that stuff to your kids? Or to yourself? Ugh! Did you know that here in the United States, our chemical ingredients are toxic and unpronounceable. If you compare soda labels from the U.S. to those in Europe, you’ll find the ingredients in Europe are actually easy to understand and are relatively safe in comparison to the high fructose nightmares we are feeding our people here. Just saying. But better than going to Europe to purchase soda pop, why not make your own natural soda? It’s easy! It’s cheap! It’s delicious! Find out how to make Berry Soda here. It is SO cool to make your own beers, ales, and meads. These kinds of drinks contain alcohol, which you can control yourself to an extent. It’s a fun process, and when you get the basics down, you can start playing around with adding herbs for some extra health. Here are a few recipes you may like: How to Make Your Own Home Brew: Chamomile Ale. You might also like How to Make Elder Flower, Mugwort, an Ginger Ale. There are more ale and beer recipes over on the blog too! Did you know that you can create your very own delicious (no-chemical) hot chocolate mix? And if you want, you can add herbal spices to kick it up a notch? You sure can! This hot cocoa mix makes a great drink on a cold day, and it also is a wonderful homemade gift to give to friends and family! These are so simple and easy to make. Just buy your single spices in bulk from Starwest Botanicals or Amazon. Then follow one of the millions of recipes to create your own taco seasoning, pumpkin pie spice, Jamaican jerk, Chinese 5 spice, curry and more! You’ll get to avoid added salts and chemicals—-and just taste how good the spices really are. Hot sauce is incredibly easy to make! And it’s healthy and good for you! Here is how to make your own hot sauce, and you’ll never go back to store bought once you start experimenting with your own variations. You might be wondering about this, are you? Well, nettles are a highly nutritious herb. Making nettle powder is one of the easiest ways to get extra greens into your diet and the foods your kids eat too. Best of all, they won’t even know it’s there! Not into nettles? No problem! Substitute with beet greens, spinach, kale, or other greens. You can find out how to make this nutritious power packed powder here. Do you now how easy it is to make fruit vinegar, including your own raw apple cider vinegar? Yep. It’s pretty unbelievable. Why spend $7.00 on a small bottle of Bragg’s raw apple cider vinegar when you can easily make your own. Find out how to branch out from there and use your fruit harvest to make different fruit vinegars too! I love my cheese. All the kinds of cheese! So, I decided I’d better learn to make my own. I took Corina Sahlin’s cheese making course, and I loved it! I learned how to make several different kinds of cheeses, including delicious goat cheese. Why pay several dollars for what you can make even better and more natural for just pennies? Just like many of the other food items in this list, why pay so much for something that’s so simple to make? And you get a more healthy product? AND you save a ton of money too! Here are a couple of my favorite bread recipes that are also easy: Vintage French Bread (the original white bread) and Easy Seeded Bread. And if you want some healthy dessert type breads, try my Chocolate Zucchini bread or my Paleo Banana-Cranberry Bread. Since we are talking about bread, how about making your own croutons while you’re at it too? Bake your own bread for health….and a delicious smelling home. Did you know you can make your very own calcium powder? Check out this article that explains how and why. And here is another article with all kinds of ways to use calcium powder in addition to using it to help strengthen bones. I have so many fermented foods recipes on the blog that it would be impossible to list them all. Just go to the little magnifying glass icon and search “ferment” and you can take your pick. In the meantime, if you don’t really know much about homemade fermented foods, take a look at this article: What is Fermentation and Why You Need Fermented Foods Every Day. Raise your hand if you have a cupboard full of herbal tea in those tea bags? Well, you might want to consider the fact that many of those bags are made with a form of PVC, not a great thing to put in hot water, then drink down. How about making your very own tea blends instead? and you can find even more in my eBook: Create Your Own Herbal Teas for Pleasure and Health. You’ll find instructions for creating your own tea blends. It’s really easy to make your very own tea blends, like this Green Tea Chai. We have a VERY large golden lab who weighs 130 pounds. He eats a LOT. Now the trend is to give pets more natural food, and you can even find refrigerated raw foods in places like Costco these days, too. But we can’t afford that. You may not agree with this, but our dogs get lots of scraps because they are omnivores. Mr. V. and I do not eat processed foods and do a lot of cooking from scratch. If we don’t have enough left over to save for the next day, our dogs reap the benefits. We also hunt and are able to make pet food from much of the meat we kill. NOTE: I do not recommend giving your dog or cat scraps from packaged, processed foods. That stuff is just filled with chemicals and is about as unnatural as it comes. Did you know you can grow your own mealworms in a glass terrarium super easily? I haven’t written about this yet, but I plan to. You can mix different powdered herbs to create your own de-wormers for your animals. This requires some knowledge, however, but if you are up to it, you should give it a try. In the meantime, you might like this brand. Make your own salves, oils, butters, & balms for health and beauty! My eBook will show you how, along with recipes we use in our own home! **And for a basic aspirin/ibuprofen natural substitution? Try Willow Tincture. I keep it in my purse just as most folks keep aspirin handy for that occasional headache. That link is to Amazon, but it’s easy to tincture. Click on the above article to find out how. Yeah. This stuff works great! And there are no petro-chemicals included! Pretty great, right? And guess what? It’s EASY. You can find the recipe in my latest eBook: Herbal Salves, Oils, Butters, & Balms. You may have figured out by now that we are into the prepping thing to an extent. Well, here is how you can make your own natural Quikclot! And if you really don’t want to make your own, then you should definitely pick some up and have it in your emergency supplies, just in case. Here is an Amazon link. I create a tincture from Cramp Bark. I also have a fancier one with additional herbs, but I’ve found Cramp Bark to be just wonderful. Also, making an essential oil blend of Clary Sage, Chamomile, and Fennel is very helpful too. Find out how to make a tincture. You can buy Cramp Bark from Starwest Botanicals or Amazon. Even though it’s easy to make, maybe you just don’t want to start out with herbs. You can purchase Cramp Bark Tincture if you like. Oh, honey. I need these. And I make different tinctures in different strengths, depending on what’s going on. Here is a link to the strongest one: How to Make a Sleep Aid That Saved My Marriage. For a simple Relaxation Tea, click through that link. Or, if you want to start out with Chamomile, Passion flower, or Skullcap, all of these herbs are mild sedatives. You’ll get rest and you won’t wake up groggy! You can also grow many of these herbs, dry them yourself for teas and tinctures. How affordable is that? Again, you can find out how to make a tincture here. If you sign up for my newsletter, one of the free eBooks you’ll get is How to Relax Using Herbs with some really great remedy recipes. Plus, you’ll never miss a thing! Herbal salves are one of my favorite herbal preparations to make. This is plant medicine at it’s finest! There are some wonderful herbs that help with symptoms of indigestion. I make a ginger tincture that works wonders! I generally use herbs to support different body systems, either in tincture or tea form. Here is a recipe for my liver tea, which you can tincture if you like, too. There are some wonderful home remedies that will help keep you well, help you fight off any germs you might get, and get better faster. You can find out more in my eBook, Natural Cold & Flu Care: How to Stay Well, Feel Better & Get Better Fast, and Stay Recovered. It’s well worth the small price, and you can start getting ready for cold & flu season now. You can also search the blog for all kinds of cold and flu articles. Here is one of the main ones that will help you know which herbs to use right away if you start feeling a cold or flu coming on. I’ll just mention the word, Tincture, one more time. Did you know you can make your own herbal antibiotics? I learned about this topic from many herbal books I own, but I love Harold Buhner’s two books, Herbal Antibiotics and the other related one: Herbal Antivirals. Magnesium Oil is an essential mineral that most of us are deficient in. When you start getting enough magnesium, you’d be surprised at how better you just may feel. I put it in the remedy section, but it could just as easily have been added to the supplements section too. It’s pretty expensive to purchase it, but did you know you can make your own? It’s easy and cheap! Here’s how to make magnesium oil (and why you should). 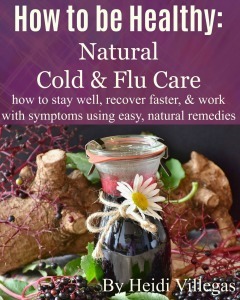 This eBook on Natural Cold & Flu Care will help you stay healthy and get better faster if you do get sick with a nasty cold or flu. Easy home remedies you can make now, and be ready for later! Honestly. If you had asked me twenty or even fifteen years ago, if I would be making ALL these things? I would have laughed in your face. Really! I was a mall shopper. I loved that make up counter. I loved my fancy schmancy items. But after learning about the horrors of the chemicals in our modern products, how animals are treated, how devious the big business/government systems are….well, as a citizen with a brain, I have decided to take charge in more and more ways as I am capable of doing, to be more self-sufficient. I (and you do too) have the right and the ability to learn what needs to be learned to be self-sufficient in this modern world of commercialism and materialism. And guess what? In that wonderful process (chicken or egg? ), I get to be healthier and save money at the same exact time! What’s not to like? Aren’t you excited about this? The possibilities? I used to be angry at feeling like I had to buy my things from the stores. With all the toxins. With the deadly chemicals. And on top of all that—-they are EXPENSIVE! But I started. Little by little. I had no idea that I would end up where I am now—-making just about all my own products. I am on a path. It’s a journey. And I have a LONG way to go, still. But with every year that goes by, I have more to share and give back and create for my family. What do you think of all this? Where are you on this path? If you are just beginning? Stand up and be proud! Be a producer! Not a consumer. Be a leader. Be in charge (as much as you can, year by year) of your own health and happiness. And money. Anyway—-I hope you’ll give some of these ideas a try. Start small. Start at a place where you think it will be fun and enjoyable. We all have limited time, so begin where you think you’ll have some sustainability in your life. The Green Living Homestead: 15 Ways to Go Green, Detoxify Your Home, While Saving Money! P.S. Sign up for the newsletter if you haven’t already! You’ll never miss a thing, and I have some great free eBooks for you too in the Resource Library! Join our community and join a group of doers! Disclaimer: I am NOT a medical professional. The statements in this article are only for informational purposes and are not in any way, implied or stated, meant to treat, diagnose, prevent, or cure any disease or illness. Please seek medical advice from the medical professional of your choice. You are ultimately in charge, so be sure to do your own research, too. These statements have not been evaluated by the FDA.